This unique resource focuses on the diagnosis and treatment of painful conditions—both acute and chronic—from a multi-disciplinary perspective. Joined by a team of nearly 200 international contributors representing a wide range of specialties, Dr. Smith presents the best management options within and across specialties. 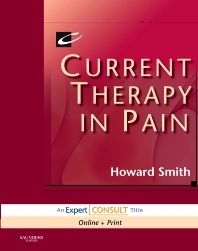 Succinct treatment and therapy guidelines enable you to quickly access clinically useful information, for both inpatient and outpatient pain management, while a 2-color format enhances readability and ease of use and highlights key concepts. And, as an Expert Consult title, it includes access to the complete contents online, fully searchable, plus links to Medline and PubMed abstracts—providing rapid, easy consultation from any computer! Includes access to the complete text online, fully searchable, plus links to Medline and PubMed abstracts—providing quick and convenient reference from anyplace with an Internet connection. Offers a cross-discipline approach to pain management for a comprehensive view of the best treatment options within and across specialties including internal medicine, gynecology, physical medicine and rehabilitation, orthopedics, and family medicine. Provides succinct treatment and therapy guidelines, enabling you to locate useful information quickly. Organizes guidance on acute and chronic therapies in a templated format, to facilitate consistent, quick-access consultation appropriate for inpatient or outpatient pain management. Features a 2-color format that enhances readability and ease of use and highlights key concepts.